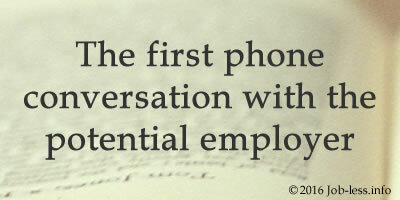 Article #3: The first phone conversation with the potential employer. Standard situation - you, having seen the vacancy suitable for you, certainly, decided to call the employer, but suddenly stop in confusion. It's not so easy to do! Really, the first phone conversation isn't less important, than a meeting with the chief. Of course, sometimes applicant's call is a simple formality. Recruiter can ask your name, age and will immediately suggest arriving to the office or coming to the meeting. Frequently, however, such talk is a full interview, and its result can significantly affect the decision - whether you'll get the job or not. So, postpone out of place affairs (don't talk to the personnel officer, lying on a sofa with a book, and even more - staring at the TV), and ask relatives not to disturb you. Prepare a notepad, take a pen and put the vacancy advertisement before eyes. Remember, if it is named the contact person that you call, you should address to the interlocutor by the name, and explain on what specific appointment you are applying for, as in the organization not one vacancy can be free. To avoid awkward pauses in conversation, keep near your own resume - because of nervousness, facts and figures can "slip your mind", and HR manager would incorrectly interpret your confusion. All are close at hand? Gather with the spirit! Now let's call! Usually such interview takes five-ten minutes, so you should have time to give the information confirming that you are the most suitable one for this job. Certainly, you shouldn't blurt out a tongue twister in a tube everything relating to your experience and professionalism. It is better to provide the initiative personnel manager who certainly has a particular pattern of communication with applicants, so give him a chance to figure out what is necessary, and tell you about the company and the appointment that he sees fit. Phone interview is the first stage of selection, during which HR manager tends to eliminate obviously unsuitable candidates. As a rule, the recruiter interested in the basic biographical facts and the main competencies of the applicant. Means, you have a chance to tell about your major achievements, to emphasize the points that represent you as an employee in the most favorable light. During interview the HR specialist not only attempts to understand, whether the competitor is suitable, but also estimates as the person on other end of a wire formulates sentences and constructs dialogue. Therefore be ready to answer questions accurately. No need to jabber or, conversely, to mumble, keep a watch on your tone (by the way, experts claim that generally it is better to talk standing - it allows to express your thoughts louder and more confident). After you answer the questions, the recruiter, probably, will suggest you to ask your own. Firstly, be sure to find out all that relates to the upcoming duties (if only, of course, they are not described in detail in the text of the ad). This will allow you to understand, whether really vacancy is so interesting to you as it seemed at first sight. In addition, you will demonstrate your professionalism - the person, who first of all pays attention to the nature and specifics of activity, should favorably impress the HR manager. Secondly, find out what kind of company is your prospective employer (after the conversation, you can search the Internet responses about this organization; visit the official website to get the most useful information). Thirdly, specify the moments which aren't reflected in the text of vacancy, for example, the schedule of work, location of firm, scales of its activity and so forth. At last, ask a question of salary (for instance, if in the ad it is specified "by agreement", "by results of interview", etc.). You shouldn't ignore the matter, but it's still better to reserve it for the final of the interview. If you didn't catch something, didn't understand, surely ask to repeat or specify that not to be trapped in future. But don't interrupt the manager - wait until he stops speaking. In general follow rules of etiquette, be correct and friendly. If after the phone interview the recruiter suggests arriving to the office - you can congratulate yourself with a little success. So, at first glance you conform to requirements of vacancy, and your candidature is worthy of detailed consideration. But to relax is too early - next the meeting with the chief is expected, and this is much more serious challenge. However, having prepared for it, you will surely cope with the task. Since you probably are interested in several vacancies, during a call (or immediately after its end) try to record all information received from the manager of recruitment, in order to avoid confusion then. For instance, allocate for each position a separate sheet in a notepad. Or create the table in a text editor of your computer, for example, with such columns as a position, the organization, the address, functionality, the schedule of work, the comments (in this column you can note important details which will help further to recollect the core of conversation) etc.